Working with a certified financial planner can be highly rewarding and valuable for you and your family. If you’re going to hire a financial adviser for the first time you might have certain questions as to what are rights you’re entitled to and what are your responsibilities as a financial planning client from financial consultant or financial planner. Let’s walk you through your rights and responsibilities as a financial planning client. 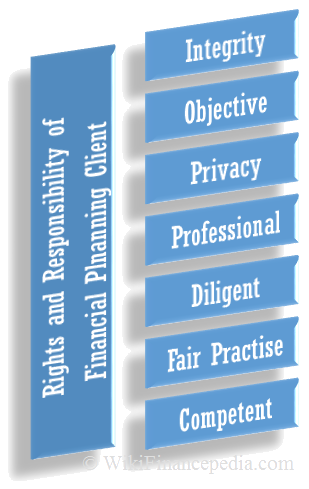 Here we will list out your rights as a financial planning client. What kind of qualities you should expect from your personal financial planner or personal financial planning consultant. As a financial planning client, when you disclose personal information to your planner like value of your assets and amount of income you generate, you expect a certain level of honesty, professionalism and integrity from your planner, and as a matter of fact you rely on him because of these qualities. You know you can trust your planner when the professional obligations are his or her priority. You know you can accomplish your financial goals when your planner places his or her principles over his or her personal gain. This helps you develop a partnership that is crucial to the success of any professional relationship. Your financial planner should be accountable for his unbiased decisions and judgment. All his experience and skills can only be of any worth to you when your needs are met. They should be at the heart of all recommendations made by your financial planner. He should rationally analyze your situation and provide you with advice that best meets your goals. This may include those moments where your financial planner explains that your goals are unrealistic with respect to your current resources and financial commitments. Trust him with his knowledge and experience. Ask him to suggest alternative goals or priorities. Financial planners who’ve attained either one of these certificates – Certified Financial Plannertm certification, Chartered Financial Consultant or Certified Public Accountant/Personal Financial Specialist designations can offer you better knowledge and plan structure to accomplish your financial goals. Your planner should complete continuing education courses as part of his or her ongoing commitment to competency. You deserve to be treated with respect and fairly. Your planner should treat you the same way he or she would like to be treated in a professional relationship. In order to be fair, the planner should disclose about his services and his price. Also he is obliged to intimate you with his incapability to assess a situation rationally and with unbiased nature. To avoid any potential interests of conflict the planner should also explain the risks associated with his or her financial recommendations. For example, what personal or financial gains will the planner achieve from your purchase of a particular product, from the outcome of a suggested strategy or from your investment in particular industry? Financial planning involves giving away a lot of personal and important financial information to your financial planner on a regular basis. This is your planner’s moral obligation to keep this information in confidence. He should only share relevant information with others when conducting business on your behalf, at your consent, or when ordered to do so by the courts. Your planner as a right of a financial planning client should not provide investment advice or stock brokerage services unless he or she is properly qualified and licensed to do so, as required by state or federal law. If your situation requires expertise that your planner does not possess, he or she should suggest other professionals who may assist you. Your financial planner should put in some real efforts to collect all the financial information, then analyze it rationally and finally optimize your financial goals and objectives. To accomplish these objectives a planner has to investigates the products or services reasonably and impartially before he or she recommends it to you. Along with all the rights, clients are subjected to some major responsibilities. To start with your responsibilities as a financial planning client, you should never lie to your planner. Come out clean about your assets. It is only after he knows your true valuation of your capitals, he will be able to help you identify and accomplish your goals. This implies, you providing the planner with data, documents, and other relevant information in time so he or she can start the work of assessment and coming up with an effective strategy. You’re also expected to sign forms and make arrangements with other professionals such as their CPA, attorney, or insurance agent. Secondly, you’ve to be realistic. Don’t demand for any impractical target that might make your planner uncomfortable. Although you’re entitled to change the decision anytime you want but it is important that you respect the planner. He or she has comparatively more knowledge than you in financial planning, so trust them with their job and if you want to incur any changes in the plan, inform them as soon as possible. And finally, always pay close heat to what he or she tells you. It is for our own good.